The vast majority of paleontological findings of vertebrate remains include fragmentary specimens that carry limited information on their respective species. Collectively, they may help us build a better picture of when an extinct species first evolved, its anatomical makeup, its relationship to other species and perhaps even its lifestyle. In rare occasions, however, one single specimen can reveal a substantial amount of valuable information that overwhelms not only what we knew about one particular species, but also about an entire group of animals. 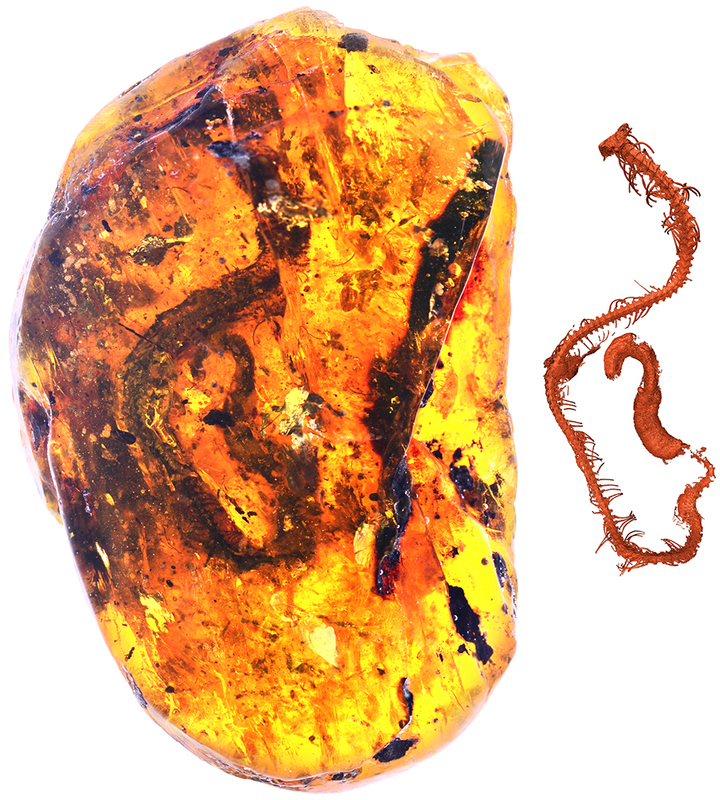 One such instance in which amazingly preserved specimens can be found are those represented by small vertebrates captured and preserved in amber. Although fossilized organisms preserved in amber usually constitute insects and plant material, such as the fossilized mosquito famously depicted in the Jurassic Park franchise, amber may also capture and preserve small vertebrates. In the later case, not only the animal skeleton may be preserved, but also soft tissues such as its internal organs, skin or feathers, thus providing a rare insight into the soft body anatomy of organisms that lived millions of years ago. Fig. 1. 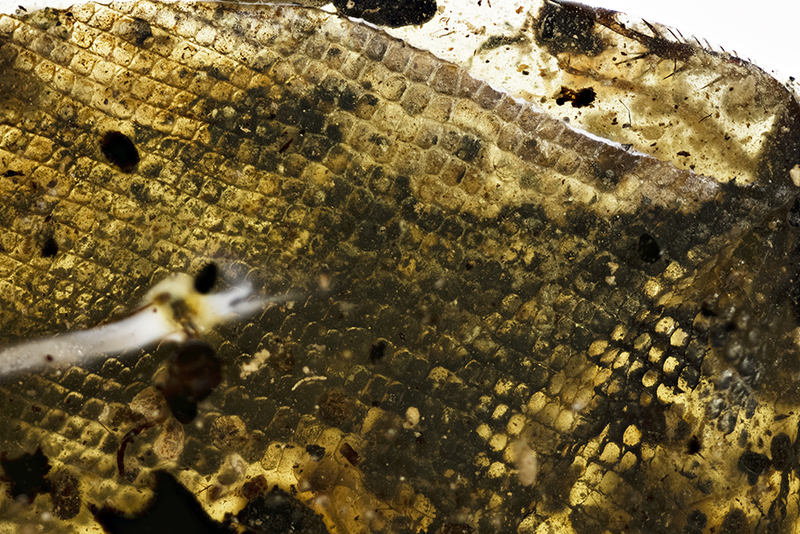 Remains of snake shed skin and amber piece containing the holotype of Xiaophis . In a new study just published yesterday, in which I had the opportunity to contribute as a co-author, it was revealed the remains of the first ever snake fossil found in amber: a new species called Xiaophis myanmarensis. Importantly, this is no regular snake. This specimen represents the first embryonic to neonate snake from the fossil record, it is the oldest known fossil snake from the landmasses that today form the Asian continent, and it even preserves patches of soft tissues. Such a remarkable finding has the potential to hold remarkable insights into snake evolution, and this specimen did not disappoint us. The degree of ossification of the vertebrae in this new specimen is remarkably similar to what we see in modern hatchling snakes, indicating that the timing of ossification of vertebral elements in modern snakes is the same as at least some of the snakes that lived as far back as 100 million years ago. Such a discovery calls into question, for instance, possible constraints on the timing of ossification patterns across snakes. 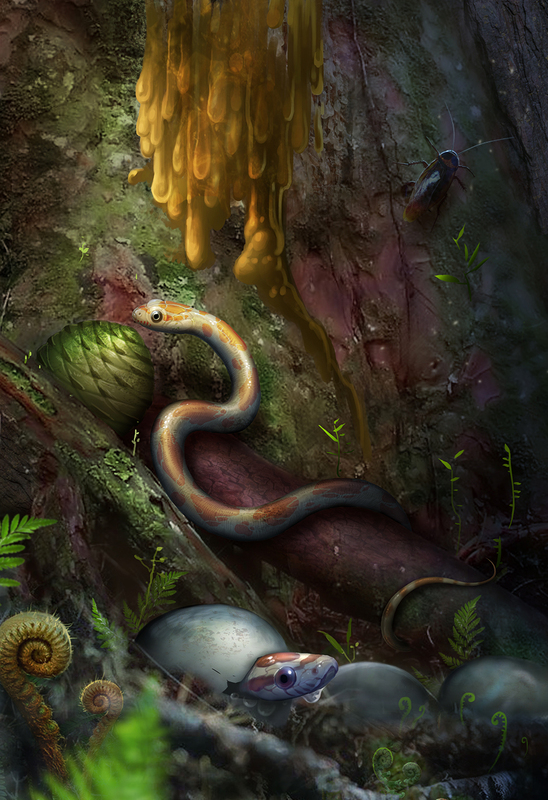 Additionally, this snake is the first ever fossil snake from the Mesozoic for which we have hard evidence indicating that it lived in forested environments, suggesting that snakes lived in a greater range of environmental conditions during the Mesozoic than we knew until now. Finally, the new species has important taxonomic similarities to fossil snakes from Gondwana (the supercontinent that was once formed by most of modern-day southern continents). However, it was found in the country of Myanmar, which at the time was part of a group of islands (of Gondwanan origin) that would eventually collide with other landmasses of Laurasian origin to form southeastern Asia. Therefore, it opens a new and interesting biogeographic scenario for early evolving snakes: that some snake faunas from Gondwana could have reached Asia (and therefore Laurasia) through the rafting of island arcs of Gondwanan origin.